There is an overwhelming concern about the incidents due to gas leakage in various industries. Moreover, there is a lot of poisonous gases that are liberated from the industries and put human lives at risk. Now, according to a 2017 report by the Centers for Disease Control and Prevention, there were 393 deaths resulting from unintentional carbon dioxide inhalation in 2015 , and the industries are trying to control the same to date which is leading to the growing demand for gas detectors. 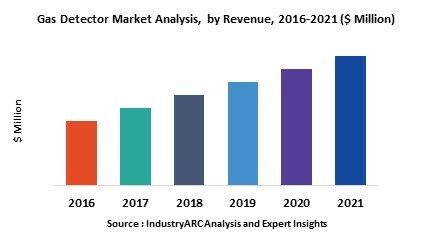 According to the market analyst of IndustryARC, gas detector market size was valued to be $2100 million to $2400 million in 2018. Furthermore, the market expert estimates the demand for the product to growth at a CAGR of 4% during the forecast period of 2019 to 2025. The mining industry in North America is undergoing a glaring growth owing to the rising commodity prices. Furthermore, there has been a noticeable industrial development in various sectors such as oil and gas, chemicals, and others in the region. Now, these industries are highly vulnerable to the incidents due to gas leakage which is leading to a sustainable demand for gas detectors in the region. Moreover, there are stringent workplace safety regulations that are enforced by the government in North America, so, the region is leading the gas detector market share with a significant 27% to 30%. A gas detector is a device that detects the presence of hazardous gases such as methane, carbon monoxide, hydrogen sulphide, and hydrogen cyanide. Gas detectors are comprised of toxic gas alarms and combustible gas alarms to detect the presence of both kinds of gases. These devices find applications in oil & gas, mining, food processing, and other industries which are susceptible to the incidents caused by gas leakage. The leading application of gas detectors is in the mining sectors which will grow with a CAGR of 3.5% to 4.5%, according to the market expert of IndustryARC. With the enormous number of infrastructural development projects and continuously catapulting production of vehicles, the demand for iron and steel is increasing at a significant rate. Now, this is leading to a growth of the mining industry across the globe. Now, the workers working in the mining sector are highly vulnerable to the hazards due to gas leakage, which is aiding to the gas detector market growth. The tangible economic growth in the developing countries has led to a significant increase in per capita income. This is, subsequently increasing the number of vehicles in the form of passenger cars on the road. According to the Organization of the Petroleum Exporting Countries (OPEC), the demand for oil in developing countries, especially the ones in Asia is increasing. Furthermore, between 2016 and 2022, the demand for oil is expected to grow on an average by almost 1.2 mb/d per annum . Now, this is leading to a remarkable rise in the oil and gas production across the globe which is becoming a huge gas detector marketplace. Not only industries but the residential and commercial sectors are prone to fire incidents due to the presence of combustible gases. “The rising need for monitoring these combustible gases to reduce the risk of fire incidents or accidents that are caused by gas leakage is becoming a major concern in each sector, which is further leading to sustainable market demand for the product and the subsequent gas detector market growth,” highlights the analyst in the market research report. Gas detector market is predominantly based on workplace safety which warrants precision in the device. Now, the major challenge in the gas detector manufacturing is that the devices sometimes fail to detect the harmful gases, and more importantly, differentiate between hazardous and non-hazardous gases which leads to ambiguity in the operations and intermittent false signals. However, the vendors are alleviating this challenge by investing in new technologies and developing better sensors. Some of the leading players in gas detector market are ABB, Emerson Electric Co, Honeywell International Inc, Siemens AG, Figaro Engineering Inc, Drager Nederland B.V., MSA Safety Inc, RIKEN KEIKI Co. Ltd., Dragerwerk AG & Co KgaA, and SENSIT Technologies. In September 2016, the global safety equipment manufacturer, MSA Safety Inc. announced the acquisition of Senscient Inc., a leader in the gas detector market. The acquisition attributed to the vision of MSA Safety Inc. to position itself as a holistic safety equipment provider. Latest Development – International Gas Detectors recently launched its advanced 2-wire gas detection technology in which the devices are networked using two core cables which offers major benefits to specifiers, installers, and end-users. Now, this technology is likely to make strides in the gas detector market. The base year of the study is 2018, with forecast done up to 2025. The study presents a thorough analysis of the competitive landscape, taking into account the market shares of the leading companies. It also provides information on unit shipments. These provide the key market participants with the necessary business intelligence and help them understand the future of the gas detectors market. The assessment includes the forecast, an overview of the competitive structure, the market shares of the competitors, as well as the market trends, market demands, market drivers, market challenges, and product analysis. The market drivers and restraints have been assessed to fathom their impact over the forecast period. This report further identifies the key opportunities for growth while also detailing the key challenges and possible threats. The key areas of focus include the types of gas detectors market, and their specific applications in the oil & gas, building automation, mining, industrial & other sectors. The report analyses the product demands on the bases of the type of sensor used in the gas detectors which can be electrochemical, ultrasonic, semiconductor, infrared, and others. The gas detector market can be further segmented on the basis of product type which is portable and fixed. 15.9. California Analytical Instruments Inc.